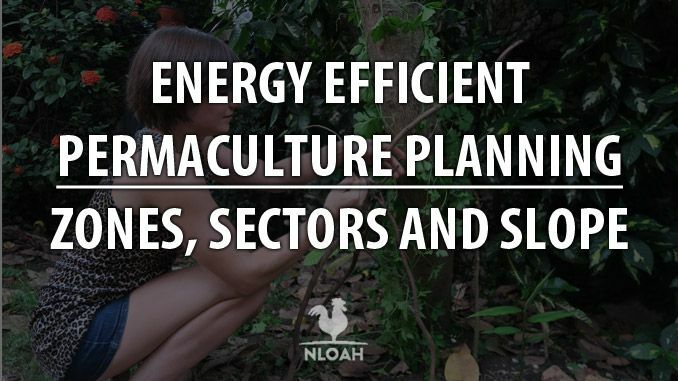 One of the key concepts in permaculture is the idea of energy efficient planning. In order to create the maximum effects with the minimum amount of work, energy efficient planning is key. This enables you to work more effectively as a person, utilizing all the energies that pass through and occur within your site to produce a more innovative system, as to not use up all your own energy and burnout. What is Zoning in Permaculture? According to Bill Mollison’s permaculture principles, the very first principle is ‘Relative Location’ and the fourth is ‘Energy Efficient Planning. Both of these components work in synchronicity and underpin the concept of zoning. When we split our sites into zones, we consider what activity goes on and how frequently it occurs. In doing this, we can work out which things need the most attention most often and therefore where to situate them on your site. Effectively, everything should be placed in accordance with its use and its needs in relation to you and your home. Logically, it makes perfect sense — obviously you want your kitchen garden close to your kitchen, not deep into a forested area on your property. Zoning is a way for us to consider the internal energies that flow through our system in order to design our sites to suit the patterns of those energies. In practical terms, this manifests as placing the things you use most often closest to yourself, your energetic patterns, and inevitably your house. Equally the elements that need more regular care are also placed closer to home. In contrast, elements that are self-sufficient and require little attention tend to be placed further away. However, it is very important to remember that, while zoning diagrams often show a series of concentric circles, sites are never this perfect. In fact, most often houses are placed on the edge of the property so that they are near the road. With this in mind, zones are developed in terms of access. Those elements that need the most care or are used the most often should be the elements that are most easy to access from the home. In this sense, zoning can be said to be in relative location to you, your home, and the energies that flow within your system. While no zones have hard and fast boundaries, by zoning our sites we designate areas to thrive as self-contained eco-systems. It isn’t like you split off each zone with a fence to function alone; zoning just helps to create an energy efficient master plan for elemental placement in the eco-system of your house and garden. One of the very underpinning concepts of permaculture is making the system work so that you don’t have to. Inherent in this is the idea of energy efficiency, whether it be from saving electricity to preventing the creation of excess work. Zoning helps to create an energy efficient pattern for your daily/weekly/monthly workload. When you have a large farm and a menagerie of projects, everything can get a little overwhelming. This can lead to you forgetting vital jobs that need to get done, or favoring some projects over others, neglecting some altogether. Zoning is an organized way for you to get everything done that needs to get done through effective site planning. By having the things that need constant work closer to your home, you’ll find these jobs don’t get left undone. Equally, by understanding which elements of the system have similar usage and needs, you can work out which elements work together to complete some of the functions themselves, without need for you to do any work at all. In terms of being beneficial to you and your site, zones help to encourage energy efficient design which leads to more effective project management. It is far easier to give up on maintaining an herb spiral that’s miles the other side of the site, instead opting to buy herbs in the store. An herb spiral outside your front door demands your care while also producing a yield and serving as an ornamental display without much effort. Equally, zoning allows you to understand edge a little better. You will find that by maintaining the zonal patterns, interesting interactions will occur between these zones, providing you with merger areas that enable unique occurrences. For example, the edge between Zone 3’s pasture land and Zone 4’s wilder forest area will provide the perfect habitat for certain birds that would not usually nest in either zone. Birds, like the dunnock, like to have both light and protection, something this crossover provides. By capitalizing on this, you can increase your bird population, which will decrease your pest population. While there are traditionally 6 zones, social permaculturalists often introduce a seventh zone. The zones here refer to land management and site design as opposed to the People Care zones outlined by Looby Macnamara. 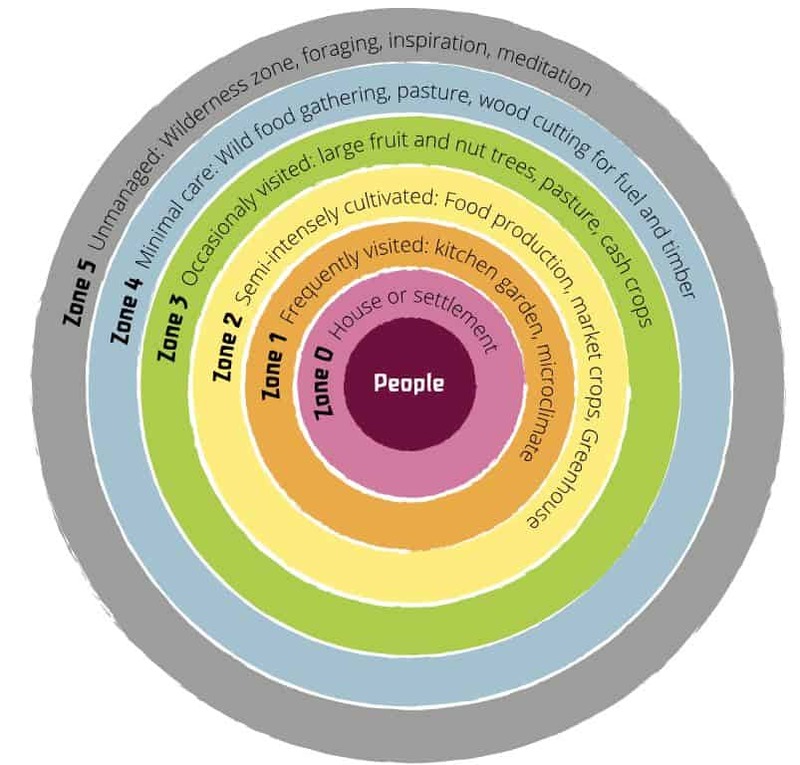 Permaculture zones are a rough guide and are not set in stone. Your zones should be defined in relation to your lifestyle. Introduced by Looby Macnamara, Zone 00 refers to oneself and the acts we carry out to ensure self-care. While this does cross over to the social side, it is important to consider the ‘self’ when designing as without a good level of self-care, no other zones will flourish. Without considering your own perspective, you may place your house in an unwanted area with a view you dislike or you may place the geese too close to your bedroom, waking you up early in the morning. Self-understanding is the first place to start. Equally, you will want to design your site in relation to your own energetic pattern. For example, say you swim in your pond every morning, this becomes an area that is accessed very often and can therefore be considered Zone 1 rather than Zone 2. Zone 0 refers to the house. As the hub of activity, zones are situated in relation to how easily they are accessed from the home. In general, this means that things that need most care or are used the placed with most easy access from the home. If you have the good fortune to be building your own house, generally you would place your house on the highest plane of the property, but most people have pre-existing houses and therefore have to work with this when zoning the property. Zone 1 is the most intensely managed area. This area is most used and you’ll find you have much tighter control over this area than other zones on your property. When you consider what you do in your life, this will help you to understand which elements you should put here – think about the input and outputs of your home in terms of food, water, waste and so on. Are you a person who likes to throw some freshly cut cilantro into your omelet in the morning? Toby Hemenway, in his famous book Gaia’s Garden, says that if you go out to chop some herbs in your slippers and they’re wet from morning dew when you return, then the herbs are too far away. In this respect, consider the activities that go on in the house daily and place the elements that work with those processes close to the house. Typically, Zone 1 will incorporate a kitchen garden for veggies and salad greens that have shorter growing seasons and can be harvested more frequently. You may have an herb spiral in there for culinary and medicinal uses. Sometimes people add small fruit trees that they may use in the kitchen, typically a lemon or orange tree (you can also use this to provide natural shade). Perhaps you have a worm compost bin for processing kitchen waste, or rainwater tanks to collect run-off from the roof of the house that feed into the kitchen. Your tool shed is likely to be here, as well as seedling nurseries that need watering daily. Sometimes people keep smaller, less wild animals near the home, such as rabbits or guinea pigs — you can actually place them against the home to utilize the warmth they generate! This is the most complexly designed zone, allowing for more efficient habits of management to occur on a daily basis. 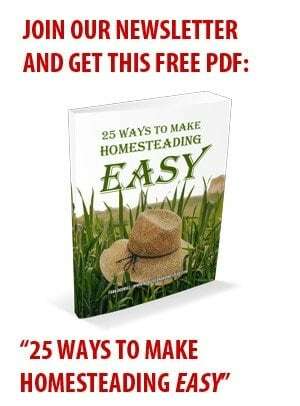 For example, say you have a chicken coop in Zone 1 so that you can feed them daily and collect eggs, you can place salad greens along the path to the chickens. This allows you to collect the salad to make your packed lunch for work on the way to feed the chickens in the morning. Equally, why not plant your favorite herbs on your windowsill above your kitchen sink? That way you can collect them without leaving the house and you won’t forget to water them as they’ll be right in front of you every time you use the sink. Remember, that just because an area is close to the house, doesn’t mean it is Zone 1. You may have an area to the side of your house that you never visit or use; this would not be counted as Zone 1! Zone 2 is still quite intensely used and designed, but less so than Zone 1. This zone may not be visited daily but does get attention a few times a week, depending on how automated your systems are (irrigation, sheet mulching etc). Often chickens sit on the edge of Zone 1 and Zone 2, but you may find larger animal enclosures here such as goats or sheep. This zone will incorporate your perennial vegetables that have longer growing season, need less care, and are harvested less frequently. By the same logic, fruit trees tend to live in this zone too. Ponds are generally located on the higher spots of Zone 2 and compost piles tend to be littered around this area for intermittently improving the soil of these plantings. Zone 3 tends to be farmland and where larger, more self-sufficient activity takes place. Well-designed Zone 3 areas are able to look after themselves with less interruption and need for care. In this area, for example, you may have an orchard of larger trees and pigs may be situated out here to graze on fruit that’s fallen from the trees. Pastures for larger livestock are placed in this zone, while large-scale water storage such as dams and animal drinking water areas tend to be placed here too. In terms of management, Zone 3 is more likely to employ ‘green mulching’ or the planting of cover crops to improve the soil as opposed to composting or sheet mulching which need human involvement. Zone 4 is known as the ‘semi-wild’ area. Smaller sites may not have the capacity for this area but those that do will leave this part of the site less managed. This area has much more of a ‘forest’ feel to it and incorporates a range of smaller and larger trees, edible and inedible crops. This area if perfect for foraging, whether it be for firewood, edible weeds, naturally edible forest products, or other non-edible harvests that can be found in the forest. This area can also be used to grow certain products that thrive in the forest such as mushroom cultivation. In terms of maintenance, this is known as semi-wild as animals are usually used to help maintain this area. Animals are set to graze and forage, naturally controlling new growth, thinning the forest, and replenishing the cycles that occur. Often people control this free-roaming somewhat by fencing off various areas at any one time. Zone 5 is the wild area of your property. While not every site is big enough to have a Zone 5, having a small area dedicated to this purpose will help to teach you a plethora of lessons. In permaculture, we try to design from patterns to details, using biomimicry as a starting point for our designs. In this sense, by having an area that is completely uncultivated, you can see the natural site-specific patterns that occur and use these to learn about the best ways to manage your site. By using Zone 5 as an observation area, you can recognize the ways that uncultivated plants deal with change, adapt to the seasons, and occur in natural patterns. By mimicking those behaviors, you’ll find your own garden to be far more resilient. Zones are very specific to the flow of energy present within your own system. For example, if you have difficulty walking long distances, Zone 1 is likely to be smaller and restricted to only covering flat areas. If you are a person who enjoys running the perimeter of your 2-acre property every day, you’ll find your Zone 1 to be decidedly larger. In this manner, every zone’s size is in relation to your patterns of behavior. In order to grow enough vegetables for one person, you only need 50 square meters of space. 1000 square meters or ¼ acre is a great average size for a Zone 1 serving a family of four people. It should realistically be the distance that is easy for you to reach each day without effort. In terms of producing perennial vegetables for a family of four with a few meat products, one acre is sufficient space to accommodate growth and animal requirements. This area is very dependent on your usage. If you are commercially farming, this area is likely to be far larger as you may include a fruit producing orchard and a large market garden on it. Equally for those who work with livestock production, you will need a lot of space for pasture. These zones can be any size, ranging from large to small. If you have a very sizeable plot of land, you can leave quite large amounts of it untouched which will encourage wildlife to flourish, improving foraging and hunting potential. If you have a smaller site, these may not even exist. That said, including a small area to learn from, no matter the property size, will always be beneficial. Sectors are the next part of energy efficient planning and they describe paths of energy that go in and out your site. Sectors are more focused on the energy that’s externally impacting your site. When we consider our sites, try to picture which energies are passing through the site. In doing this, it helps us to consider which energies can be useful for the site and utilized to make other jobs easier, as well as working out where elements should be placed. 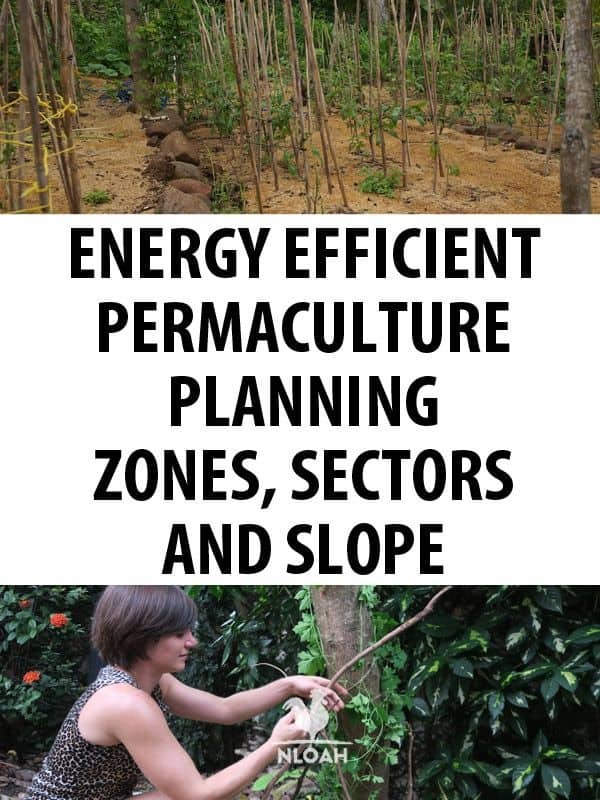 One of the important rules of permaculture is about capturing energy as it passes through the site. 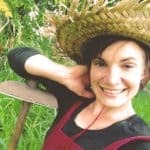 A skilled permaculture designer will capture that energy and utilize it as many times as they can, recycling it through the site to perform various jobs before it leaves. In this sense, a sector analysis is important to understand which energies flow through, how fast or slow they are traveling, the pattern in which they travel, and how they behave and interact with the environment. You can respond to your sector analysis in a few keys ways by blocking energies you’d rather not have, like cold winds; by channeling energies to more appropriate areas of the site, such as water diversion; or by opening up areas to encourage energies, like sun access. Sometimes the more specific patterns of energies are referred to as flow analyses. This list is by no means exhaustive. When you observe the natural state of your site, you may find a whole range of other energetic factors that have an influence on your site. Observation is key to recognizing this, so do not overlook the value of extensive and intensive observation periods. You can usually work out the Sun’s pattern by looking up the latitude of your property. However, observing the Sun’s movement firsthand will enable you to see how it is blocked or exposed by other elements on the site, such as large trees, fences, and buildings. Track both the winter and summer Sun angles, using the summer and winter solstice dates as the polar opposites. Example of utilization: By attaching an extended sloped roof to buildings at the right angle, summer Sun will pass over the roof, keeping the house shaded in hotter months. In the winter, however, the Sun’s arc across the sky is lower. This means it will travel under the pitched roof and serve to warm the house. Wind can be damaging if it comes at force, which can be an issue for buildings and vegetable gardens. Equally, cold winter winds want to be diverted from households, whereas cool summer breezes may be encouraged. Understanding the direction and the strength of the wind that passes through your site can be done by observing the pattern of tree flags (how the trees bend and are shaped), as well as looking at erosion on rock faces. 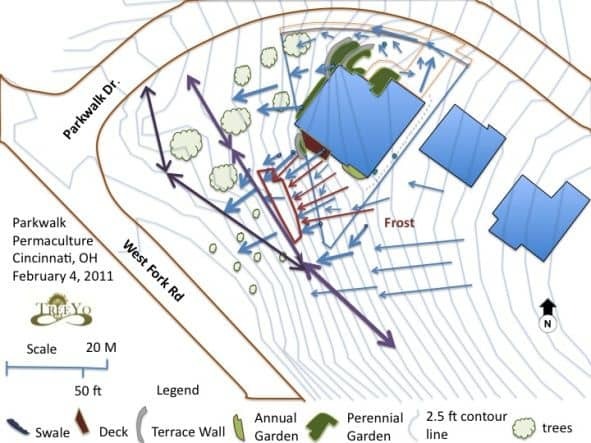 Example: By building wind breaks in certain areas of the site, you can funnel the wind to turn turbines on other locations on the site to create energy. When we consider water on our sites, we want to think about rainfall and how this flows through the site. Are there ponds that overflow? Does your driveway become flooded? Where does the run-off from impervious surfaces go? Track the rainfall of your property simply with a bucket and a ruler. When you’re having heavy downpours, follow the water to pattern its direction and volume of flow. This will help you to understand erosion patterns in the land and how to shape the land for preservation. Example: Capturing rainfall from the roof of your house can be used irrigate your garden using a series of gravity-feeding divertive and on-contour swales. If you live in a fire-prone area, this is a really important consideration. Fire travels most easily and quickly in an upward direction. As most houses tend to be placed on the highest spot on the property, this can be a fire risk. In this sense, you will need to track where fire can travel most easily, identifying wind patterns and site materials (wooden fences, forests, pine needles, log piles). Example: By tracking wildfire potential, you can employ fire-proofing mechanisms to protect your home and animals, such as stone walling or fire-resistant hedges. Having wildlife come through your site can be a pleasure and a useful mechanism. For example, certain birds coming through may eat pests in your garden, which can be very useful. However, wild rabbits and deer may enter your property and gobbling all your produce. When watched over time, you’ll realize that animals tend to have patterns of behavior that are relatively predictable. Example: Say you notice a deer eating your vegetables every day, jumping the fence around the garden. By putting a curved fence around the garden that diverts them to an area that needs maintenance, you will steer the deer away from your garden while also having them trim back areas that have become overgrown.. Consider where you live and what you can hear around you. Different sounds can either be welcoming or a nuisance, depending on the sounds. Say your neighbor has a dog that barks all night long. You are not going to want your bedroom window next to where that dog sleeps. Example: Perhaps you live by the coast. The sound of the ocean can be relaxing, helping to bring on sleep. Having your house positioned in such a way to take advantage of this will help you get more enjoyable rest. Sector maps can be confusing to take in however drawing your own will help you to understand the sectors to place certain elements and the sectors that should be avoided. You can see the overlap of the energies as well, helping you to create more interactive design. Caption: Sector maps can show us where energies are present and where they overlap. Sector diagrams tend to widen out from the central point of Zone 0, the house. Standing in the house, you want to consider the direction from which the energy originates. For example, say you can hear a noise, where does it come from? This sound is likely to fan across the site, which is why the diagrams appear like small wedges. These wedges refer to the whole area covered where that energy can be felt. Once all these sectors have been placed on a map with overlapping wedges, you can see the crossovers. This enables you to focus your attention more carefully. For example, wildfire sectors that cross over with sectors of strong wind will need serious consideration for safety purposes. While zones and sectors occur from a bird’s eye view, referred to an ‘map view’, when we consider slope, we’re cutting the land through to understanding the cross sections that run through the land. This is referred to as ‘plan view’. Patterning the slopes helps us to better understand the behavior behind energy flow. For example, sharper gradients of slopes will lead to fire traveling more quickly upward and water traveling more quickly downward. The shapes of the slopes may be irregular, causing water to fall one way and then the next. The slopes on our site can also help us to manage freeze zones and to plant in areas that are blocked from the wind, or to guide water for irrigation and storage. The easiest way to get a detailed understanding of slope on your site is to look at the contour lines on a map. How Do Flow Analyses Work? While sector maps can show us the direction in which our energies come from, slope can help us to understand how these energies move vertically through the site. Combing these two considerations creates a flow analysis. Does water travel quickly in a straight line down a sharply graduating slope? Does it meander around smaller lumps on the site? Where does the water pool before moving on? In doing this, we can more easily see the natural channels and how we may want to manipulate these. Again, we can see the crossovers of energies to also understand how they affect each other, how we can work with this, and perhaps how we remedy it if it’s a problem. Energy efficient design will you help you to better manage your site and to block, channel, and open up energies for use. By considering the flow of these energies and their crossovers, you can create dynamic systems that take advantage of these energies, recycle them through the site, and decrease the amount of personal energy you have to put in to get all the work done, while decreasing waste and cost. In other words, energy efficient design maximizes the effects while minimizing the work, allowing the system to work so you don’t have to!